"Our approach to cycling is to encourage a safe mix with other traffic – our busy road network and densely populated area mean that it is not practical to allocate road space specifically to cyclists. Instead, we focus on providing a smooth, debris–free riding surface, cycle parking and increasing the permeability of the local road network." The Royal Borough of Kensington and Chelsea believes that cycling can and should mix safely with other traffic. On the left is a picture of the space for cycling just by the Millenium Bridge, along Queen Victoria Street. It's not in Kensington and Chelsea, I admit, but I feel it's a good representation of what a safe mix of cycling with other traffic actually looks like in London. Basically, on your bike, you'll just have to fight the law of the jungle and try and outwit those more powerful, faster, more dangerous, highly polluting motor vehicles on your little old bicycle. And it could all be so different. Here's Admiralty Arch by Trafalgar Square. 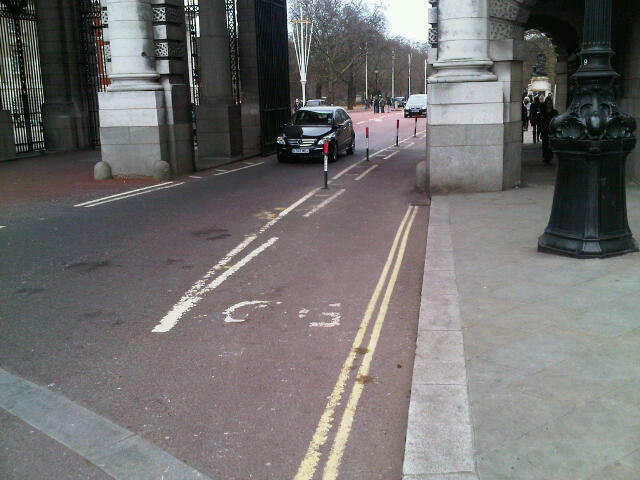 Notice the bollards and the segregated cycle infrastructure. This is the exact opposite of a safe mix with other traffic. Before they put the bollards in, this was a two-lane motor traffic queue. It was essentially useless as a cycling route in rush hour as you simply couldn't get through on your bike without sitting in the motor queue, going nowhere. A bit like the chaps on New Bridge Street in this pictures here, a lot of people cycled around the queue on the pavement. All too often, it's really the junctions that hold up people's ability to cycle through London. Junctions and bridges, actually. Just look at the map of cycle casualties in London here (all casualties from 2004 - 8) and you'll see clusters of casualties on bridges or on the approach to junctions. Have a look at the area around Oval station, for example. Or Vauxhall. Or the north side of Blackfriars Bridge. Each red dot is a cyclist death. Each blue dot is a serious injury. So I passionately disagree with the Kensington and Chelsea transport plan that cycling should always 'mix safely' with other traffic. If we're going to get people on their bicycles in London, then junctions are the place we need to start. And we need to consider ways to keep cycles and motor traffic apart more efficiently than we do at the moment. The City of London is talking about 10% of journeys being made by bicycle. But that's never going to happen unless the roads (starting with 'scary' juntions) are considered a subjectively safe and convenient environment for cycling for a wider group of people than those who currently choose to get on their bikes. Will you investigate turning roads or other routes over to be exclusive arterial cycle routes along the city’s west-east and north-south axes? Cycle Superhighways and other cycling programmes aim to provide high quality arterial cycling routes. Future schemes will continue to provide conditions where cyclists are separated from other traffic where feasible. However, the scope for providing exclusive arterial cycle routes is limited given the space constraints of London’s road network. 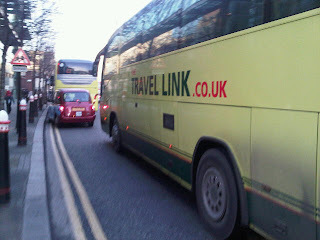 Our authorities know they need to separate cycling from motor traffic at key points. Here's the Mayor actually saying exactly that. But then they simply wimp out by telling us there isn't space. Look at London's streets, in particular at its junctions. There's plenty of space. But no-one's got the political nerve to actually reallocate some of the four lanes for motor vehicles that come off Blackfriars Bridge, for example, and make the space calmer, slower and easier to cycle through. Which is why I suspect the Mayor will simply wave through the Kensington and Chelsea transport plan and agree with the royal borough that is not practical to allocate road space specifically to cyclists. It is perfectly practical. The Mayor even acknowledges this is something London needs in his written answer to Jenny Jones. But I, for one, don't believe the Mayor or his transport authoritity TfL have the political nerve to do it. Of course the first item in the Hierarchy of Provision is "Traffic Reduction". And Boris has done the opposite by removing the Congestion Charge from this area. Grr. 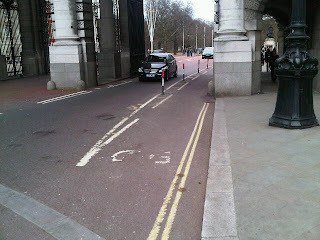 re the admiralty arch cycle lane, i saw a driver in a gee-whiz electric car join the cycle lane there as the traffic was so heavy the other day. it was funny enough but then as the driver came through the arch, he was surprised to come face-to-face with two even-more-surprised cycle-cops. copper - "WHAT THE- GET OVER HERE YOU EFFING IDIOT! NOW!"